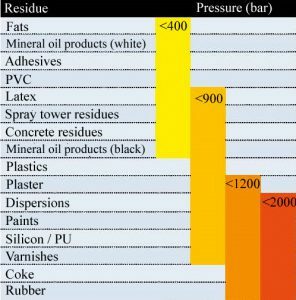 High-pressure water can clean surfaces easily, efficiently, and safely. 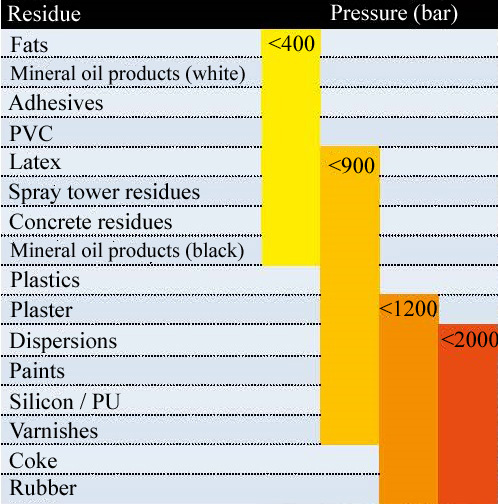 The chart below depicts typical pressures required to remove various materials. 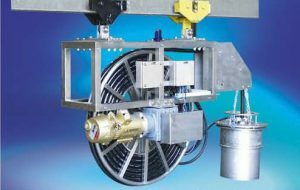 A high-pressure cleaning system is safe, increases product quality and production, and offers a fast return on investment. Contact Chemac and find out how water can improve your plants productions and product quality. Effective: To date, the most thorough and fastest cleaning method. Reduces vessel "out of service" time which maximizes plant and equipment capacity. The best return on investment! Experience: With cleaning systems installed around the globe, our Uraca systems engineers have the experience to get the job done right the first time. 3D: Three dimensional cleaning effect cleans the entire vessel such that product quality and plant efficiency can be improved. Environmentally Friendly: Chemicals or solvents are eliminated as cleaning agents. The TWK units utilize water, which eliminates the need to dispose of environmentally hazardous substances. Flexible: Clean on demand. No more lost production time waiting for a cleaning. Control: Manual, semi- or fully-automated systems reduce personnel costs. As much control or as little as required to get the job done. Reduces Emmissions: Hermetically and/or pressure tight systems are available. Reduces the need to purge or flush vessels. Avoids the escape of hazardous discharges into the work area. Fast: Extremely efficient nozzles improve cleaning time, reduce water usage and electrical power consumption. Cleaning is measured in minutes not hours or days! Service: Fast service eliminates down time. Chemac Inc. is ready to service your URACA tools and systems 24 hours a day. Contact Chemac for your high pressure cleaning needs. Each system is designed to meet customers' cleaning goals. Our cleaning system consultants will help design the correct cleaning solution for your needs. For a complete list of high pressure cleaning systems and tools, consult the PDFs below. Find out how much an automated system can save your company. Send us an inquiry from our inquiry page for a free analysis of your cleaning needs.